Tuckaleechee Caverns and Davy Crocket Riding Stables are about a mile from each other and only a few miles from our Smoky Mountain Lodging. 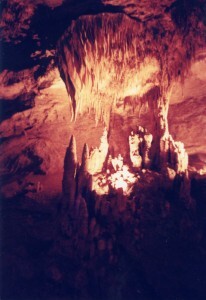 Forbidden Caverns are located straight N of Gracehill Bed and Breakfast, NE of Sevierville, and a 30 mile, 45 minute drive from here in good traffic. The Lost Sea is SW of us near Madisonville in Sweetwater, a 56-mile drive, and hour and 15 minute trip. Traffic to Lost Sea shouldn’t be a problem any time of year. All three of these caverns are lovely, but Tuckaleechee is a stone’s throw away. Formed 20 to 30 million years ago (what’s 10 million years anyway??? 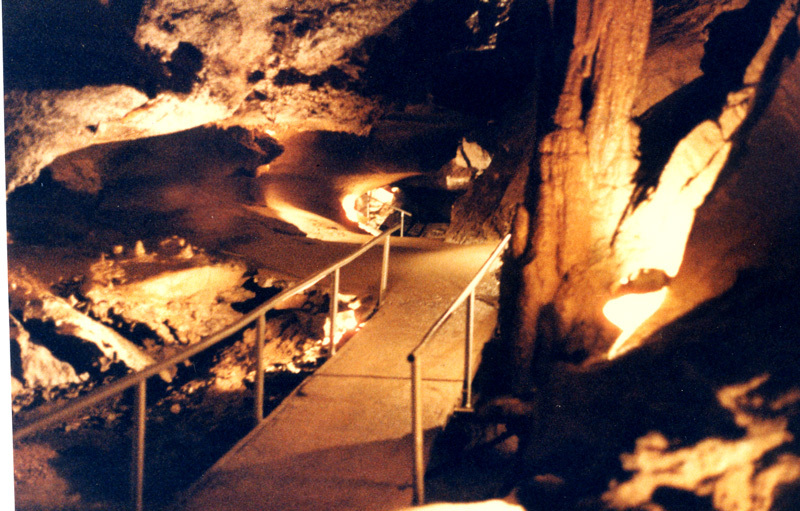 ), Tuckaleechee Caverns are in one of the earth’s oldest mountain chains and known as the “Greatest Site Under the Smokies.” The eastern band of the Cherokee Indians probably used them long before the “white” man discovered the caves around 1850. They have had a colorful history since that time. They opened briefly in 1931 for a year, and then closed due to the depression. Two young boys, Bill Vananda and Harry Myers of Townsend, TN played in and around them through their childhood. In 1949, while attending Maryville College, they talked about opening them to the public. It was a long road, including working a stint in Alaska to raise capital but they managed to open in 1953 after carrying in 100’s of tons of sand, cement and gravel on their backs to build steps and passageways. In 1955, the “Big” room was discovered, 400 feet long, 300 feet wide and 150 feet deep. To put it in perspective, Mammoth Cave in Kentucky is 120 feet tall. Electric lights were also added in 1955. In 1982 Mr. Myers sold out to Mr. Vananda and members of his family still run it today. About 50,000 tours are given a year. Keep in mind if it is in the 90’s in the dead of summer, the cave is a constant 58 degrees and you won’t get wet if it is raining out! Tuckaleechee Caverns is seasonal, but when open, it is seven days a week from 10am to 6pm. Ticket prices are $15.00 for adults, children 5-11, $7.00, and age 4 and younger is free.